I accidentally posted this last night with barely anything written in it. Oops. I have no clue what to talk about today, I planned this as a ‘TBT’ but NATURALLY I didn’t think of anything to write today. SMART. 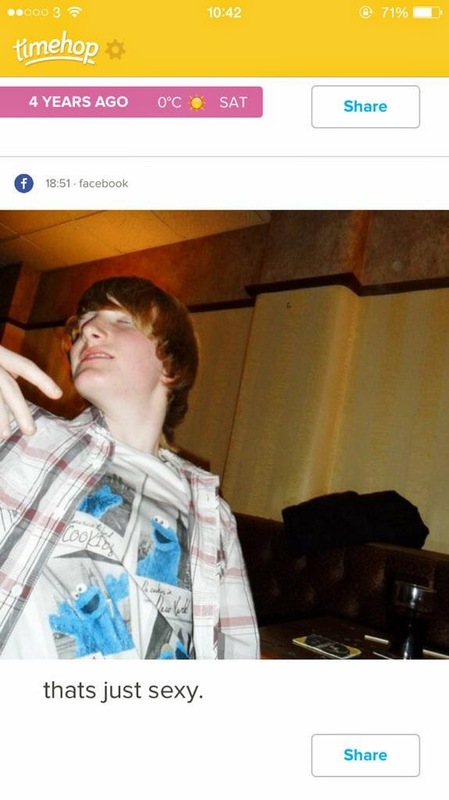 I’m actually writing this the night before, and I think I will make this a literal TBT by showing you what my Timehop shows for Thursday 22nd January. Unless it’s dull or embarrassing. I now remember January 23rd 2014 VERY CLEARLY. 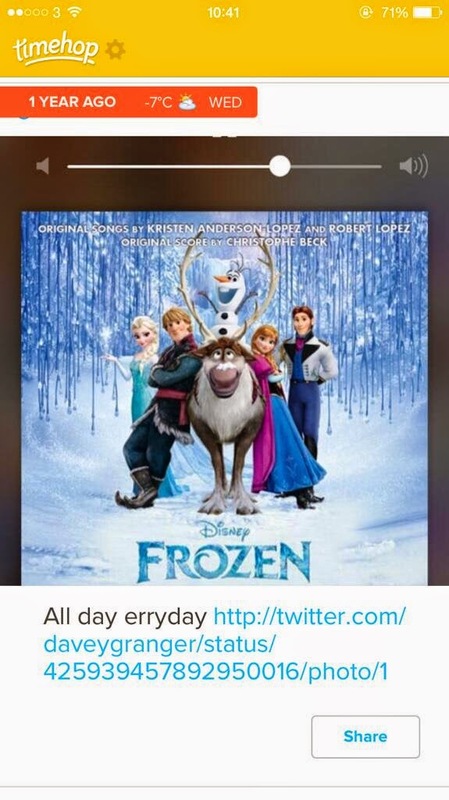 I had just watched Frozen for the first time, and I fell in love with Let it Go, much like…everyone in the entire world. 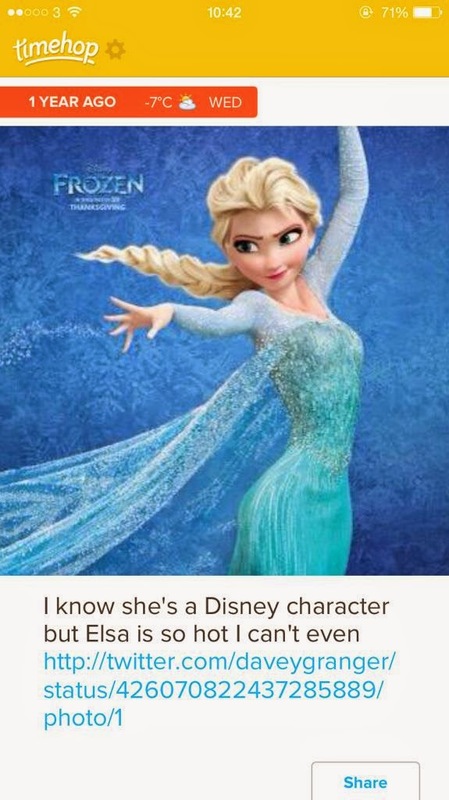 I discovered my crush on Elsa. Again, like most people. This is a bad screenshot. 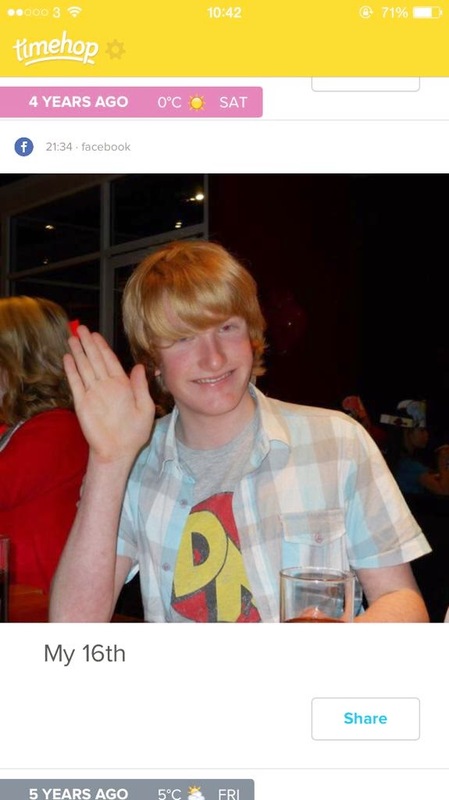 I still lived at home at this point, and I came into Liverpool to pick up some things I needed before going to Amsterdam at the end of the month, and also to look at Frozen things in the Disney Store, as it was all new and exciting at the time!! 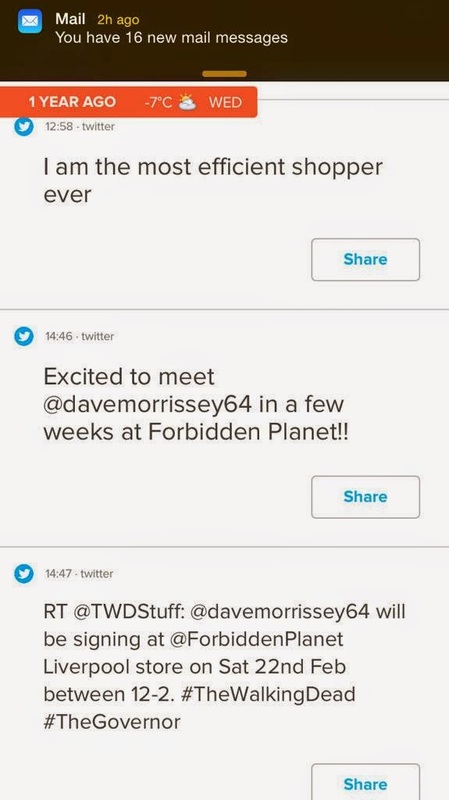 I then met David Morrissey, AKA the Governor in The Walking Dead in Forbidden Planet a few weeks later! 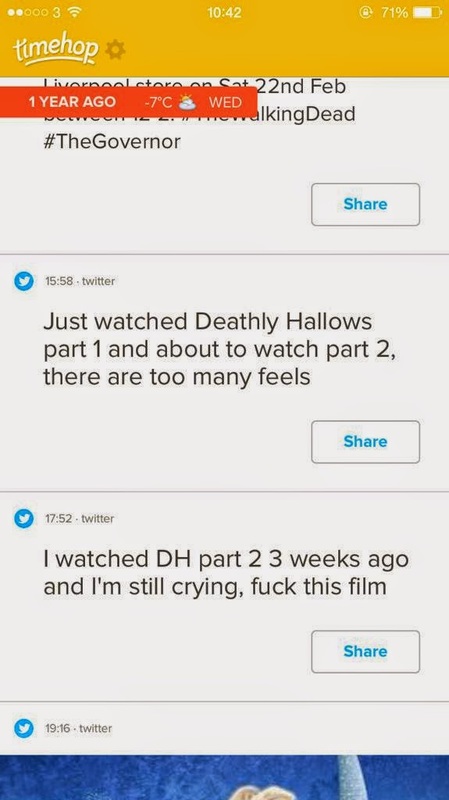 Later, I came home and watched both Harry Potter and the Deathly Hallows films with my mum. I don’t think I’ve watched them since then! That’s a full year, and that is not okay. I am ashamed of myself for that. Grace Helbig hit 1 million subscribers again! And I will be seeing her today, exactly a year later, at a Q+A/signing event! That’s weirdly coincidental! In a way. Kinda not. But it is. 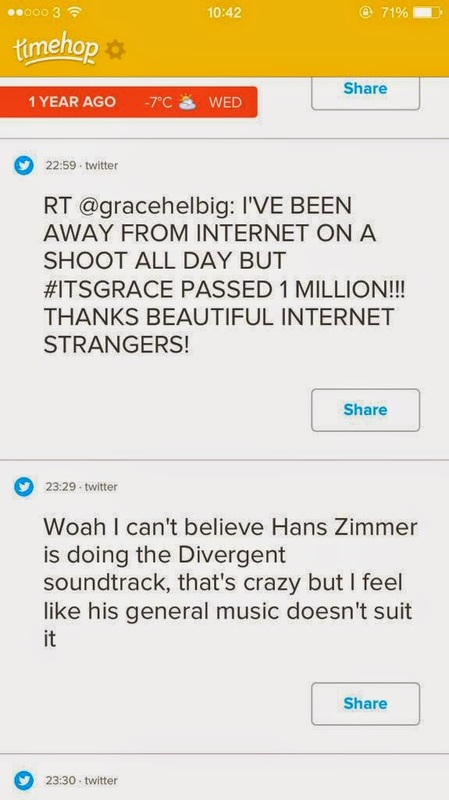 I don’t remember tweeting that about Divergent, and all I actually can recall about the soundtrack is that ‘Beating Heart’ by Ellie Goulding was played constantly and I don’t like actual vocal music played over films. I can’t remember what the rest of the music was like in the slightest. 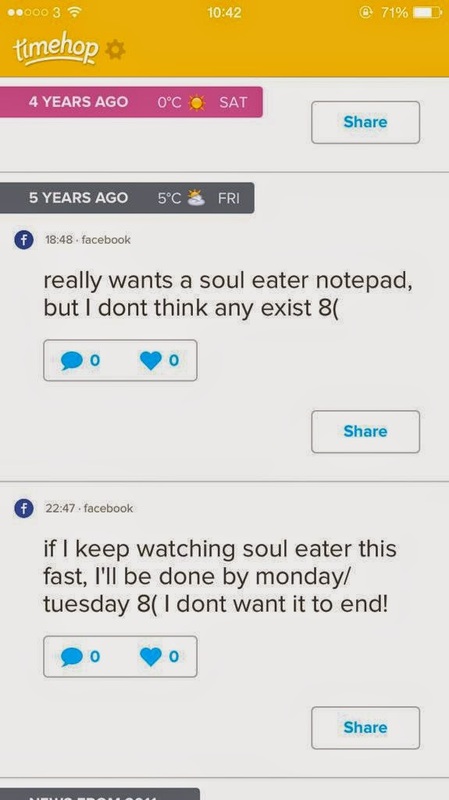 5 years ago I loved notepads. Nothing has changed. And let these images serve as a reminder that things do get better after high school. Sorry that this is a little rushed, I was busy yesterday, and I’m annoyed because I went to the perfect restaurant to blog, and forgot my camera. I’m also busy today, there’s A LOT filming that needs doing before I go home, as well as a lot of cleaning and a lot of packing and a lot of meeting Grace Helbig at her book signing to do!! !